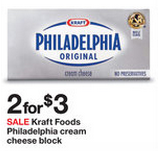 This week, Target has Philadelphia Cream Cheese blocks on sale 2/$3. This sale doesn’t appear in the printed copy, but does show up in the online version. This is a great sale price alone, but we have a $0.50/1 Philadelphia Cream Cheese, 8 oz coupon to make these just $1 each! That’s definitely a stock up price in my book.